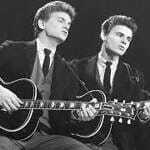 Learn how to play the songs by The Everly Brothers note-for-note on guitar with The Everly Brothers Guitar Lessons. Each lesson includes the playthru, video lesson, songsheet with chords and tab. The lessons are exactly what Don or Phil (or a combination of the two) plays where they play an accompaniment through the song. Where the song contains no, or very little, guitar I’ve arranged the accompaniment for guitar.